HOOVER, Alabama -- Tuscaloosa's Deontay Wilder has come a long way since his days as an amateur boxer, but he hasn't forgotten his roots. The 2008 Olympic boxing bronze medalist sparred with local boxers Tuesday night at the grand opening of the new Golden Gloves boxing facility at American Fitness Center in Hoover. 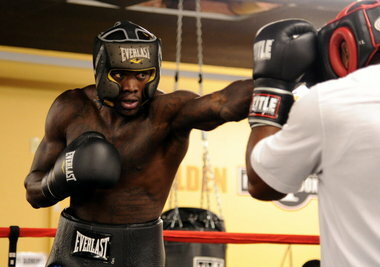 The event served to wrap up training for Wilder, who fights Dominique Alexander on Saturday at Water Oaks Farm Arena in Tuscaloosa, as well as to promote Golden Gloves boxing. "It means a lot to me," said Wilder, who enters this weekend's matchup with 17 knockouts and a 17-0 record since turning pro in late 2008. "A lot of these guys boxing look up to me. Some of these guys are here because of me." Approximately 50 spectators filled the gym to watch the 6-foot-7 Wilder spar with five local boxers, including former Hoover High and NC State linebacker Avery Gibson. Each sparring session lasted about 90 seconds, with an encore between Wilder and Gibson drawing the biggest cheers from the crowd.